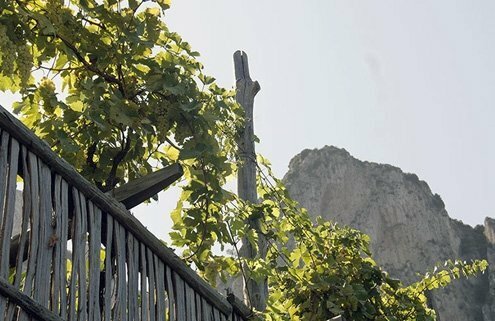 Capri's tiny Scala Fenicia is the rocky island's only active vineyard. uriosity can be powerful and inspiring. I have one group of clients that insists on delving into the wines of a different region each time they visit Italy. This year we traveled to Campania and the Amalfi Coast. Among our pre-trip rituals is a relaxing meal in Rome where we discuss the wines we’re about to sample. It’s exciting for everyone. Most everyone knows about Naples and pizza, Pompeii and Herculaneum, Capri and Sorrento. The Amalfi Coast is as famous as any in the world and helps make the Naples area into a tourist hub. What fewer know is that Greek and Etruscan viticulture once intersected here. Paestum was a Greek city called Poseidonia. Naples was and remains a vibrant port city. In ancient Rome, wines produced in Campania felix — the happy land — were among the peninsula’s most expensive and sought-after. But quantity replaced quality over the centuries. After World War II, heavy industry brought mass wine production with some of it shipped north to France and Germany for use in blending. The Campania wine industry lost its charm. Since the early 1990s, however, it’s been making something of a comeback, with detail-oriented viticulturists trying to reestablish top-notch products. As a frequent visitor to Naples and the Amalfi Coast, I tend to stick to respected and highly-rated DOCG wines — whites such as Fiano d’Avellino and Greco di Tufo and reds including Aglianico di Taburno and Taurasi. In our pre-trip dinner, I decided it would be useless to try to cover all the region’s wine zones in a single chat. There’s just too much ground. Instead, I decided to focus both the conversation and the first part of our travels on Campania’s less-mentioned coastal wine areas, Capri, Vesuvius, Paestum and Cilento. Each has a highly specific wine heritage that goes back thousands of years and is untouched by international varieties like chardonnay and cabernet. We began our southern jaunt on the terraced vineyards of Capri, where only indigenous grape varieties are cultivated. Scala Fenicia, overlooking the Tyrrhenian Sea, is the island’s only active vineyard. To get there you must climb the Phoenician steps, an ancient stairway that connects Marina Grande with Anacapri. The miniscule vineyards cover about an acre, with rows of 50-year-old vines growing on pergolas among fruit trees and gardens. The grape varieties grown are falanghina, greco, piedirosso and biancolella. We tasted Scala Fenicia Capri Bianco DOC 2013 (12%) €18, an elegant white with citrus and thyme aromas. Serve it with a fried fish appetizer or try it with mozzarella di bufala. Next stop, Vesuvius, whose volcano offers up jaw-dropping landscapes. The main white grape varieties here are coda di volpe and falanghina, while the reds include piedirosso, aglianico and sciascinoso. Lacryma Christi, which translates as “Christ’s tears,” is the staple. Legend has it that Lucifer took a part of Heaven to create the Bay of Naples and Jesus’ tears at this loss nurtured the grapes. Lacryma Christi reds include easy drinking fruity piedirosso and earthy aglianico. The whites employ crisp falanghina with coda di volpe or caprettone. There are some 20 active wineries around Vesuvius, with 2,800 acres of vineyards. We tasted Cantine Olivella Vesuvio Emblema Vesuvio Bianco DOC 2013 (13%) €16, made from 100 percent Caprettone grapes. This is a beautiful white with notes of honey that has a decisive and dry finish. Enjoy it with fior di latte or scamorza cheese or fried baccala. We also tasted Cantine Olivella Lacrimanero, Lacryma Christi del Vesuvio rosso DOC 2014 (13%) €9, a red with plum and berry aromas, nice acidity and gentle tannins, a find compliment to meatballs or eggplant parmesan. Our final stop was Paestum and Cilento, home to ancient Greek temples, sandy beaches and prestigious buffalo dairy farms. This isn’t volcanic land. The sun-soaked seaside villages are awash in olive groves, and the San Giovanni vineyard in Castellabate is among the region’s loveliest. There, we sampled San Giovanni Paestum I.G.T., Tresinus 2013 (13.5%) €23, a 100 percent fiano white that’s briny with herbal notes and a fruity finish. It goes perfectly with baked fish such as sea bass. That concluded the first stage of our Campania wine sojourn. Stay tuned for next month’s chapter two. Rome-based sommelier Gina Tringali has written extensively about wine.